11th Aug – Al emailed in this evening to say that they are now back in La Paz. Mike, Graham, Mike, David & Vincent reached the summit along with leaders Al & Cecillio the local guide. Alan and Mary broke 6000m so are happy with their efforts. Tony decided not to attempt the summit but was happy with all the peaks he’d achieved on the trip. Well done to all. 7th Aug – The team have now returned back to La Paz from Huayana Potosi, Mary felt ill on the summit day, so returned to camp with her father, she is now much better. Despite the deluge of snow the team encountered the night before the rest of the team still managed to bag the summit, but under difficult conditions. 5th Aug – The team have arrived back in La Paz after their first foray into the mountains. They first visited Copacabana on the shore of Lake Titicaca, where they made a high level traverse of Isla del Sol and visited some Inca ruins at the North of the Island. 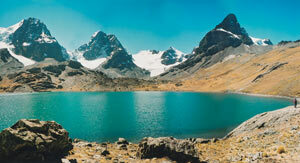 After that they then drove to Tuni and trekked in to Condoriri base camp to climb their first peaks. Graham was ill the first day so missed out Point Austria and Pyramid Blanca, however he went up Point Austria with his brother after he had recovered. All the team climbed the stunning Pequeno Alpamayo and to add to the fantastic weather no body else was on the glacier, so the team had the mountain to themselves. On the second rest day the local guide Cecillio, Graham and Michael climbed Illusion. Alan took the rest of the team to the Ice cascade by the glacier for a spot of Ice climbing. Today the group have returned to La Paz for a spot of freshening up and a night in a hotel bed, before leaving for Huyana Potosi in the morning, the first of two 6000m peaks in the trip. This classic expedition to the Cordillera Real offers a magnificent setting for the mountaineer to ascend some magnificent and shapely peaks.